We are Denver’s most gentle and complete wildlife service! Call Boulder Wildlife Removal for animal removal and wildlife control throughout Boulder, County. Nuisance wildlife control experts can provide solutions to all types of wild animal problems including bats, snakes, squirrels, raccoons, possums, rats, birds, and skunks. Wildlife Removal services include rat control, bird control, raccoon removal, squirrel removal and bat control. 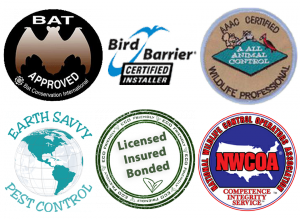 We also provide seal up and exclusion work to prevent bats, squirrels, raccoons or any other Colorado wildlife from coming back. A All Animal Control of Boulder, CO is licensed and insured to meet all the requirements of the state of Colorado. Boulder Squirrel Removal needs to be done before squirrels damage your home or business. Squirrel control in Boulder is a very common call. Squirrel Removal and control is on the rise and should be handled as soon as you know you have squirrels in the attic. If you hear noises in the attic or scratching in the attic, call A All Animal Control Houston. The squirrels in the area are getting very comfortable with residents of the city. Squirrel removal should be handled in a timely fashion before the squirrels chew your wiring creating a fire hazard. Squirrels will also contaminate your attic insulation creating an unhealthy environment. Boulder Bat Removal is common around homes and buildings in Boulder, Colorado. We also provide bat guano removal and can help with bats in the attic. Bats can be found living in attics, eaves, soffits, chimneys, shutters and behind siding. If bats find a quarter inch gap, they will move inside. Bat control and removal should be initiated as soon as they have been discovered. Colorado is home to the most common bats, the Little Brown Bat and Big Brown Bat. We are experts in bat removal and bat exclusion in Boulder CO, Colorado. Boulder Raccoon Removal is needed because raccoons can cause problems to your home or business. This includes raccoons digging through your trash or garbage can or tearing up your yard. The most popular raccoon removal calls are raccoons in attic or chimney. This call is common in the early winter and late spring of the year. This is when the female raccoons will give birth to their young. This is a tough problem for an expert to perform because the raccoon babies are often in very tight spots and are hard to reach. Get rid of raccoons as soon as possible and call A All Animal Control. Boulder Snake Removal from your Colorado home can be a very risky task. Snakes find their way inside buildings and homes for many reasons including food and shelter. We receive calls all the time about snakes in the house or snakes in the garage. We have found snakes in attics, crawlspaces, under front porch and rear patio and in basements throughout Boulder Colorado. You should never attempt to handle a snake because we have venomous snakes in the area, such as the Western Diamondback Rattlesnake. The Garter Snake, Rattlesnake, Bull Snake, Ground Snake, Milk Snake and Water Snake are the most common species found in Colorado. Call us today for any snake removal and snake control problems. Call now for snake removal problems in Boulder Colorado. Boulder Rat Removal is another call as rats are a common species of wildlife in Boulder CO. We service all areas of Boulder and we experts in rat control and removal. Rat control and removal in Boulder should be initiated as soon as they have been discovered. Rats have a habit of chewing electrical wires which can lead to fires. If you hear noises in the attic and scratching in the attic call A All Animal Control. Boulder Bird Removal services are provided throughout Boulder, Colorado. Birds can be very messy and unhealthy. Birds will make a nest just about anywhere. Birds in the vents, birds in the soffits, birds on solar panels are calls we receive. Boulder bird removal is one of the hardest calls we receive because birds can be very challenging to control. We can also clean up any bird mess to make sure your family and pets are in a healthy environment. We handle all types of bird problems, just give us a call.